(Mises) — Arguably one of the rights that has seen less government encroachment in the US — in contrast to other activities such as commerce — gun rights are now witnessing unprecedented attacks at the state level and even from politically-connected corporate entities. To maintain its iron grip, the Soviet Union had to turn to the most proven form of suppression — gun confiscation. On December 10, 1918, the Council of People’s Commissar mandated that Soviet citizens turn in their firearms. Failure to do so, led to criminal prosecution. Second Amendment supporters often attribute gun control’s passage exclusively to Adolf Hitler’s government. However, a more thorough review of history demonstrates that the preceding Weimar government was responsible for passing gun registration. Weimar officials rationalized the passage of gun control in the name of public order, for fear of Nazis and Communists coming to blows on the street. To this day, Cuba has strict firearms regulations. Government entities like the National Revolutionary Police, the Ministry of the Interior, and the Ministry of the Revolutionary Armed Forces are in charge of regulating firearms. Like other socialist programs, the Cuban experience has been filled with death and economic destruction. Estimates point to 141,000 Cubans murdered at the hands of the Castro regime, with millions of Cubans fleeing to the United States in search of greener pastures. The Venezuelan government started by passing the original version of the Control of Arms, Munitions and Disarmament Law. Since then, the law has been modified to broaden the scope of the firearms regulated by the Venezuelan Armed forces, who have the power to register, control, and confiscate firearms. The day of reckoning came when Venezuela banned the sale of firearms and ammo in 2012, under the guise of fighting crime. Despite the gun ban in place, crime rates continue to skyrocket. Now Venezuelans have no way of defending themselves against a government that is free to muzzle their speech, expropriate their wealth, debase their currency, and starve them to death. And if that weren’t enough, the average Venezuelan must contend with the constant threat of common criminals and colectivos, Venezuela’s infamous pro-government paramilitary units. 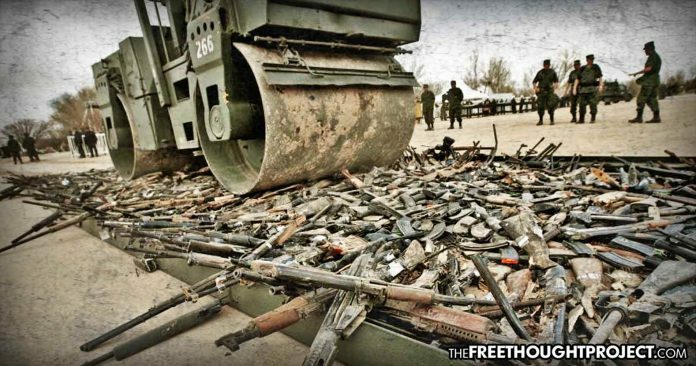 South Africa has recently embraced gun confiscation. According to The Citizen, the Constitutional Court of South Africa ordered the confiscation of about 300,000 firearms on June 7, 2018. To say political tension in South Africa is mounting would be an understatement. Since ending apartheid, South Africa has embarked on a troubling route of economic statism. To make matters worse, the South African government is currently pursuing land redistribution in order to address so-called racial injustices. Although politicians from the African National Congress (ANC) party have recently backed down from ramming land confiscation legislation into law, there is no telling what could be in store for South Africans now that gun confiscation has been activated. It would be a mistake to believe South Africa’s gun confiscation ordinance was a random occurrence; it’s the logical conclusion of South Africa’s current gun control framework. The genesis of this troubling development began with the passage of the Firearms Control Act of 2000, which features an extensive system of gun registration. It’s easy for anti-gun entities to identify gun owners and confiscate their firearms in the long-run when they have their information on the books. With the wrong political actors in power, yesterday’s “common-sense” gun control could be tomorrow’s vehicle for gun confiscation.